The Crochet Sensory Book is bound to be a treasured heirloom in my home. It is a fun crochet project to create. 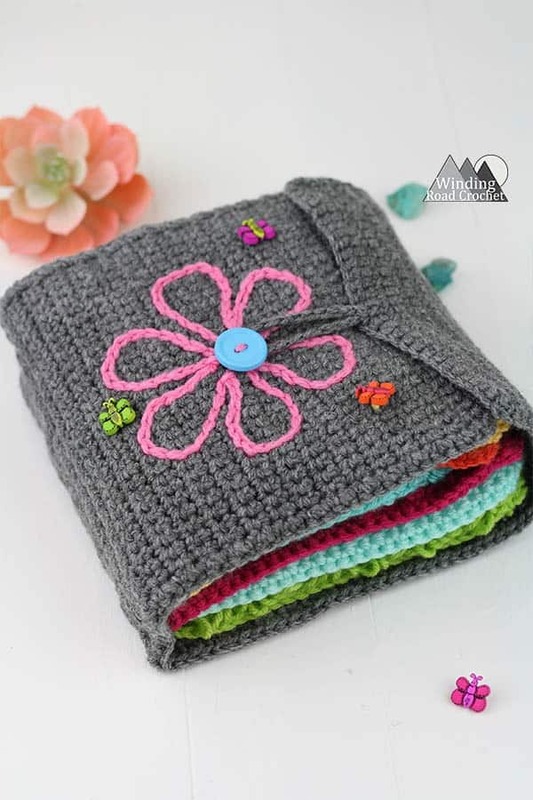 It gives the creator a chance to learn new crochet stitches and gives the receiving child a beautiful book to flip through and feel all the different textures. My daughter was stealing my sample swatches to sit and pet them before I even finished the book. At 14 months, she loves to flip through books and the look and feel books are here favorite. This book is the perfect gift for a baby or toddler. The Crochet Sensory Book is one of the final patterns from the March Texture Madness. During this Crochet A Long we learned 9 texture stitches and created 3 items that can be made with the samples swatches. To make the Book Pages for this book, we used the Medium Sizes sample swatches from the March Texture madness Crochet A Long. Follow the links below to be taken to all the stitch tutorials and make the 8 inch or medium sample swatch. I used 7 sample swatches for my book. R2-84: Ch1, turn, Sc in each St across. R85, Ch2, turn, Sc in the next 15 Sts, Ch 20, Slst to last Sc, Sc in the next 14 Sts. Do not fasten off. Note: If you would like to add all 9 Stitch Samples to the book, just add 4 more rows to the book cover. Ch1, working down the side of the rows, Sc into the side of each row, Ch1, turn at the corner, Sc in the bottom of each St across, Ch1, turn at the corner, working down the side of the rows, Sc into the side of each row, Ch1 , turn at the corner, Sc in the top of each St of row 85, skipping the Ch20 and slst. I wanted to add something special to the top of the book cover so I Surface Slip Stitched a flower to the front and added a few butterfly buttons. Follow the video tutorial to learn to Surface Slip Stitch to add your own touch to your book cover. Sew a button to the center of the book cover and use the loop to close the book. Note of caution. Some people do not like to use buttons on baby items. If you are concerned about the buttons, simply omit them. My daughter is supervised when playing with her book and does not tend to pull on the buttons, so I included them on her book. Once your cover is complete you will just need to whip stitch in your sample swatches. I used a very long piece of yarn and started at the top of one page and sewed down that page, then moved over to the next page and sewed up the edge of that page. I continued this until I ran out of yarn or had all the pages sewn in. Are you going to make a Crochet Sensory Book? I would really like to see your finished piece, take a picture and share it with me on any social media! Just tag me @windingroadcrochet, #windingroadcrochet, or #ourcrochetjourney. Join my Facebook Group and share your creation with the community at Our Crochet Journey Facebook Group! Written pattern, tutorials, graphs and pdfs of the Crochet Sensory Book are copyright Windingroadcrochet.com. Please do not reprint or repost this content as your own, but please feel free to share this link with others. You can find more information on sharing my work with others in the Terms and Conditions Page. Love this Sensory Book, my daughter runs a child care center and I have made one for her. I really love this idea! so cute. Pinned it. This would be a great idea for an Alzheimer’s patient. Yes it would, or dementia, or even autism from what I have heard others say. I think the Sensory Baby Blanket would also make a great Lapghan for a patient. I just whip stitched all the pages in with a row of Single crochet in between. I sew each page directly to the cover of the book. The pages are not sewn to each other. I actually space them by about 1/4 of an inch apart on the book cover.